Ministry of Urban Development Directorate of Estates has introduced online payment facility for online booking of holiday homes / touring officers’ hostels. till 08.04.2015 for upgradation of website for commencement of receipt of online payment through debit/ credit card. Online booking will not be available on the website of holiday homes till 08.04.2015. However, offline booking will be considered by the concerned booking authority for the period 06.04.2015 to 07.04.2015 on payment of requisite booking charges. 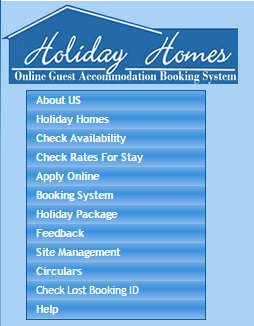 Until now, facility for Online booking of CG Holiday homes was available. However, this interface did not contain the facility of online payment of room and other charges. Central Government Employees and Pensioners who intend to book rooms in Central Government Holiday Homes had to send the room charges by demand draft only. Now, Govt has planned to introduce the facility of online payment of room charges in order to avoid the hassles of Drawing of manual Demand Draft in bank and sending the same by post. On introduction of online payment facility for Central Government Holiday homes, CG Employees have now got a full fledged online reservation system for booking these holiday homes. The terms and conditions framed by Directorate of Estates for purpose of receiving online payment for the booking of Central Government Holiday homes and hostels are listed below. Subject: Terms & Conditions of Online Booking of Accommodation of Holiday Homes and Touring Officer’s Hostels under Ministry of Urban Development/Directorate of Estates. (i) Applicant/Customer/Common Customer means Sitting Member of Parliament, Serving/Retired Central Government Employees, Serving/Retired employees of State Governments/ Union Territories/Central/State PSUs/ Autonomous/ Statutory Bodies employees. (ii) Family means spouse/dependent family member of Government servant. 3. Eligibility for booking: All applicants mentioned at para 2(i) will be eligible for holiday homes/touring officers hostels/guest houses for themselves and their spouse/dependent family members and guests. Applicant/officers drawing Grade Pay of not less than Rs. 8700 will be eligible for VIP suites of Grand Hotel Shimla while Gazetted Officers drawing grade pay not below Rs. 4600/- will be eligible for VIP suites of other holiday homes/touring officers respectively. All applicants will be eligible for other types/units of room/suites. 4. Time Limit for Online Booking. (ii) Retired Central Govt. Employees can book 15 (Fifteen) days in advance from the Check-in-date. (iii) Other applicants can book 7 (seven) days in advance from the Check-in-date. 5. Priority in Booking: Booking will be made through automated online system primarily on ‘first-come first-serve’ basis subject to fulfilment of prescribed eligibility, time limit and payment of booking charges, etc. 6. Issue of Booking confirmation Slip : Confirmation Slip, after complete online process and successful/complete payment of booking charges to Directorate of Estates for the specified booking period by the applicant through debit card/credit card (subject to activation) and internet banking, will be generated online and applicant will be required to take out print for the same for displaying/submitting to caretaker/concerned authority of holiday home/touring officer’s hostels to occupy the accommodation for specified booking period. Applicants have to use their own debit card/credit card/net banking for booking. 7. Submission of online application: Applicants will fill up all fields of online application. They have to upload a colour passport photo, a copy of ID Card issued by their present employers and in case of retired employee, a copy of PPO or Pensioner ID Card. Mandatory filed including applicants’ Permanent Account Number (PAN), Aadhar Card Number, Date of Birth, Personal Mobile No., Office Telephone No, etc. will not be left blank. After filling up all fields, the applicant has to submit the application form and thereafter, the system will lead to Payment Gate Way. After successful payment of booking charges to Directorate of Estates/Booking Agency, booking request will be processed as per prescribed procedure and agreement with the Axis Bank/any other Bank, confirmation slip will be displayed along with Booking ID No. A copy of confirmation slip can also be generated after filling Booking ID No. and PAN/ID Card No. in the relevant box. 8. Rooms not occupied after confirmed booking: After the confirmed booking, cancellation is not permitted. 10. Failed Transactions: In case of failed transactions. applicants will have to claim to Axis Bank/concerned Bank itself and Directorate of Estates will have no role in failed transactions. 11. Collection and Crediting of Booking Charges by Bank: Authorised Bank by Directorate of Estates will collect booking charges through their payment gate way and credit the same in the Government account(Directorate of Estates/Ministry of Urban Development) specified for the said purpose. In case of failed transactions, the concerned Bank has to settle with the customer directly. 12. Booking Charges: Booking charges will be applicable in terms of Directorate of Estates Office Memorandum No. D-11028/23/82-Regions (Vol. II) dated 10th July, 2012 till the further revision of the rates of charges. In addition to booking charges, customers have to also pay transaction charges/convenience charges/service charges per agreement with Axis Bank and RBI guidelines in this regard. In case applicant himself/herself is not visiting to holiday homes/touring officer’s hostels, normal booking charges will be applicable for spouse/dependent family members while private charges will be applicable for guests. 13. Transaction Charges/Service Charges/Convenience Charges: These charges have to be paid to concerned bank. Axis Bank will separate theses charges from booking charges and only booking charges will be credited into Government account by Axis Bank or as per specific agreement made in this regard. 14. Booking of more than one room: Only one room/suite will be booked in the name of applicant/spouse for the same period and same holiday home/touring officer’s hostel/guest house. There is no provision for allotment of more than one room/suite. However, in exceptional circumstances, additional room will be provided on payment of booking charges/rent @ rate of private charges at the sole discretion of the Allotting Authority and subject of availability. However, there will be no advance booking more than five days in advance from check-in date in such cases. 15. Period of booking: Accommodation is provided for a period not exceeding 5 nights. In Holiday Homes/Touring Officer’s Hostels/Guest Houses at Mussurie and Goa which have very few units but attract visitors throughout the year, the period of stay has further been restricted to 3 nights maximum. In exceptional cases, accommodation in excess of this limit can be permitted with the prior approval of competent authority. (iii) FIR will be lodged under relevant penal provisions of IPC. (Fraudulent booking means wrong information provided by the applicant intentionally). 17. Emergency Quota: Director of Estates/Allotting Authority is authorized to keep any room in reserve to meet urgent requirements of unforeseen nature or to accommodate VIPs and/or Senior Officers. The Allotting Authority is empowered to reduce the period of booking, or to cancel the booking altogether, or change the previously booked room, to meet such emergent requirements. 18. Check-out time: 9 AM and Check-in time: 11 AM to 12:00 noon. However, to avoid inconvenience to the visitors who reach the destination early in the morning after night journeys, the occupants are advised to vacate the rooms at the earliest on the last day of stay. 19. Right to Admission: The entry to the Holiday Home/Touring Officers’ Hostels/Guest Houses will be strictly on production of valid Identity Card/PAN Card issued by the Government and the attested/verified details mentioned in the application form and confirmation letter by the concerned administrative office. Entry to holiday homes/touring officers will be allowed only after depositing/submission of valid booking slip/authority slip along with verified application form and production of Identity Card. (a) Dependent family members: if not accompanying the Government servant/applicants, they must carry along with confirmation slip/letter, (a) a photocopy of the Government servant’s Identity card and Pan Card, (b) Proof of their own identity specifying their relationship with the government servant, and ( c) Certificate of Dependence issued by administrative authority of the applicant. A copy of the CGHS card containing their photographs can also be accepted for applicants covered under CGHS scheme. 22. Retired Government servants availing the facility of Holiday homes/Touring Officers Hostels: As the entries in the Check-in/ Arrivals Register are to be made by the Retired Government servant in their own writing, the presence of retired government servant is necessary at the time of checking in. A photocopy of the PPO should also be presented at the time of checking in. 23. Capacity of rooms: The capacity of double bedded room is two persons, four bedded room is four persons, VIP suites in Grand Hotel Shimla is four persons and VIP suites in other holiday homes/touring officers hostels is two persons. In addition to above, two persons/children are also allowed in the room/suit if the applicant desires for the same, however, the booking agency/caretaker will not provide additional facilities in such cases. 24. Facilities: The caretaking staff will provide to the guests the following items only once at the time of occupation of the rooms : toilet soap (small) – one, washed towel – one, washed bed-sheet/bed-cover – one set, washed pillow covers – one set, fresh toilet-paper roll. The guests are advised to make their own arrangement for additional needs as per their requirement. 25. Occupation after booking period: Occupation of the room, after expiry of the booking period, will be unauthorized. Such occupant(s) are liable to face eviction by the caretaking staff without any prior notice, and imposition of damages. 26. Washing charges: The caretaker is authorized to charge washing charges@ Rs. 30 per day per room from the occupants and issue receipt. The fund so collected will be kept in the custody of the JE/Caretaker concerned and will be used for washing the towels, bed-sheets, curtains, quilts regularly. 27. Catering facility: The catering charges wherever available will be settled by the guests with the caterer of the Holiday Home/household staff directly before check• out. 28. Feed-back: Any complaints/suggestions regarding maintenance, house• keeping, catering or misconduct on part of the caretaking staff should be brought to the notice of the Director of Estates, Nirman Bhawan, New Delhi, and/or the Allotting Authority in writing. 29. Cooking and intoxicating is strictly prohibited in the rooms of Holiday Homes/Touring Officers’ Hostels. 30. Proper Decorum: The Guests are advised to maintain decency and decorum throughout the stay period. Causing inconvenience/disturbance to other inmates through noise or rowdy behaviour will be dealt with sternly. Consumption of intoxicants in the premises is strictly prohibited. 31. Pets are not allowed in the Holiday Homes/Touring Officers’ Hostels. 32. Damage to property: The occupants will be liable to make good of any damage/loss to property, fixture, fittings and furniture during the period of their stay in the Holiday Home/Hostel. 33. Visitors of the Guests: No unauthorized person(s) will be allowed to stay with or visit the Guests in the Holiday Home/Touring Officer’s Hostel/Guest House. 34. Breach of Conditions: In case, the accommodation is not vacated on the expiry of the period or for breach of any terms and conditions stated above, the occupants will be summarily evicted physically, with force if necessary, without any notice, under Section 3-A of the Public Premises (Eviction of Unauthorized Occupants) Act of 1971, notwithstanding any other action that may be taken against him/her under the relevant Allotment Rules/Service Rules. They will also liable to pay market rate of licence fee as damages. 35. WARNING: Unauthorised/ in-eligible persons are not allowed for booking of holiday homes/touring officer’s hostels and any attempt would be treated as fraudulent booking and such persons will be held responsible and action will be taken under Information Technology Act, 2000 & its Regulations and Indian Penal Code (IPC). All applicants are advised to use their own debit card/credit card/internet banking. 36. DISCLAIMER: There is no provision for refund of booking charges even if the rooms/suits remain unutilised or vacated early by the applicant. Claim of Charge back will not be considered/permitted/allowed by the Bank.